1. Farmworkers need a voice in the decisions that affect them: Allowing workers to form a union and collectively bargain with their employer is the only way to address the huge imbalance of power and provide an effective structure for self-determination. 2. Bring all parties to the table to address industry wide problems: Large agricultural corporations have created a supply chain that enriches its executives at the expense of those who work in the fields. These corporations have the wealth and power to change the harsh realities that many farmworkers face. FLOC seeks a structure where all those in the supply chain work together to solve problems: corporations, growers, and farmworkers. Through the many successes of FLOC, conditions of our members have changed dramatically over the years. Not only have wages increased, but housing and other conditions have been improved. The greatest improvement, though, is that workers have a direct voice in their conditions through collective bargaining agreements that include an effective process for resolving grievances and problems. The FLOC movement continues to grow by building a strong popular base of supporters interested in justice. Corporations have tremendous economic and political power, but millions of people who mobilize in support of justice can collectively tip the balance of power to benefit farmworkers. In 1978, President Velasquez led over 2,000 FLOC members on strike in Ohio, the largest in agricultural history of Midwest, who demanded union recognition and a multi-party bargaining agreement. The following year, FLOC held its first constitutional convention as a labor union, and the workers voted to boycott Campbell Soup in their call for negotiations. FLOC members and their allies struggled for eight years to win the first tri-party contract ever in agriculture. These contracts changed the structure of the agricultural industry, so that farmworkers have an equal and direct voice in those conditions that affect their well-being. The FLOC movement has made labor history in bringing in different components of the industry into negotiated agreements. In 1983, Baldemar led a 600-mile march of 100 farmworkers from Toledo, Ohio, to Campbell’s headquarters in Camden, New Jersey. Such actions and the pressure of supporters through the boycott eventually convinced Campbell Soup that the issue was not going away. 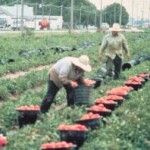 Farm labor elections were held under the supervision of an independent labor relations board, the Dunlop Commission, and in 1986, FLOC signed three-way contracts with Campbell Soup and its tomato and pickle grower associations in Ohio and Michigan. This victory was soon extended with Heinz and other major food-processing corporations in the Midwest, as well as fresh-market producers. Under union contracts, some 8,000 workers, many who had worked under an exploitive “share-cropping” arrangement, received employee status, and wages and benefits more than doubled. New housing in migrant camps and other conditions also significantly improved. Under grievance procedures established in the union contracts, FLOC workers also have a direct voice in their day-to-day working conditions, and can file complaints without fear of retaliation. 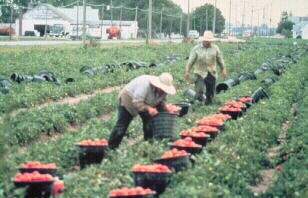 In 1998, FLOC began organizing farmworkers in North Carolina, the other major region in the U.S. where pickles are produced. After organizing thousands of farmworkers and a 5-year boycott of Mt. Olive Pickles, in 2003 FLOC won another three-way contract with Mount Olive and the North Carolina Growers Association, which included workers involved with not only pickles, but also sweet potatoes, tobacco, Christmas trees, and other crops. These contracts also set labor history, not only by changing the agricultural system but by also bringing in H2A “guest workers” under union contracts. Formerly, these workers had little say in who employed them or in the conditions of their work. 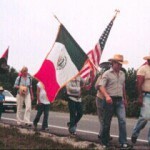 Now through their union, they have their own direct voice, and are now directly involved in labor negotiations, grievance procedures, and building structures to address issues like transportation from their home areas in Mexico, health care, and immigration policies. Today the struggle continues to organize tens of thousands of tobacco farmworkers throughout North Carolina and the South. Read more about the Reynolds Campaign here.